This architectural masterpiece is located in Brazil and is brought to us by Isabela Canaan Arquitetos. The home is resplendent in modern style and luxury, with a range of textures and finishes encasing contemporary furnishings to present an inventive and inviting design. Even from the street the house invites the gaze of onlookers, with glass panels in the fence providing a hint of the sophisticated luxury located beyond. The interior is open, expansive and filled with a sense of contemporary eclecticism, with novel elements such as an in-built green room, mezzanine living area and sleek, black kitchen creating a series of delightful design surprises. The bathroom hosts a luxurious spa trimmed in the rich tones of timber, while the master bedroom celebrates a spectrum of brown throughout its furnishings and finishes. 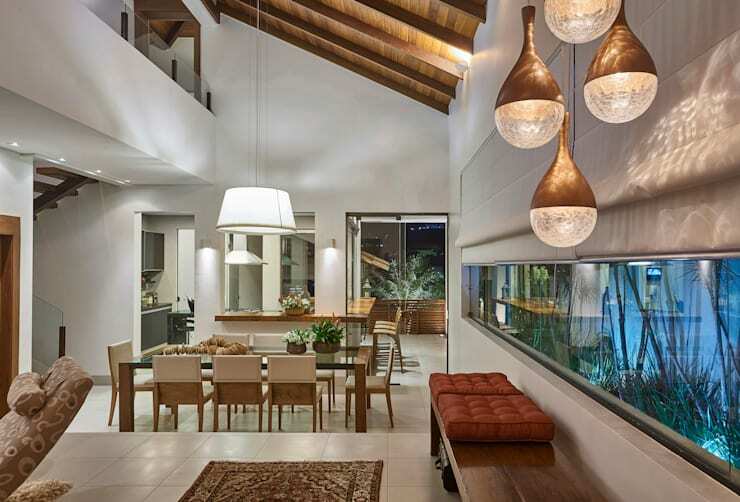 All in all this home is a fine example of inventive, modern interior architecture, and would be a dream abode in which to indulge in the warmth and vivacity of Brazilian life. Take a tour of the images below and see which design element jumps out at you! 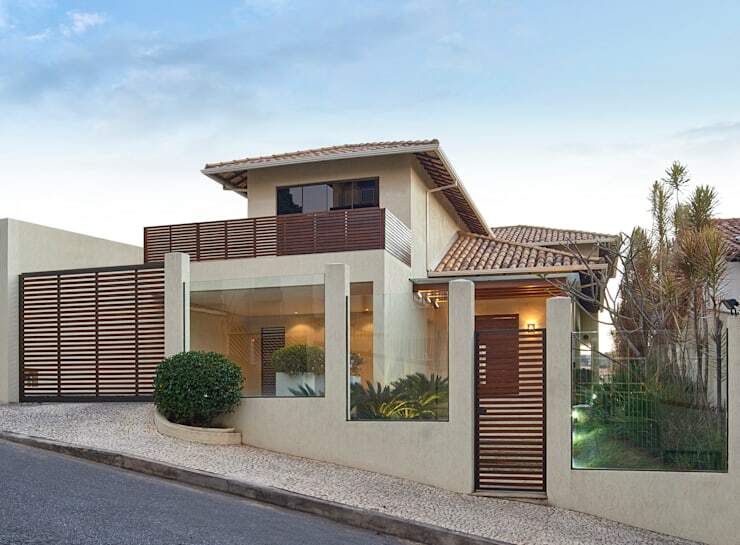 The exterior of the home presents the clean lines and sleek finishes characteristic of modern architecture, with glass, concrete and timber used to construct a geometric facade and the roof tiled in traditional terracotta. Bursts of green pop out from a well manicured garden, with the glass panelling of the front fence presenting the welcoming appeal of a window rather than the private rebuff of a high wall. The interior of the home is simply breathtaking, with the designer sparing no expense to create an inventive and luxurious space, brimming with modern touches. The living and dining areas blend into one another, with the living space subtly delineated by a raised floor, while the kitchen can be seen sectioned off in the distance. 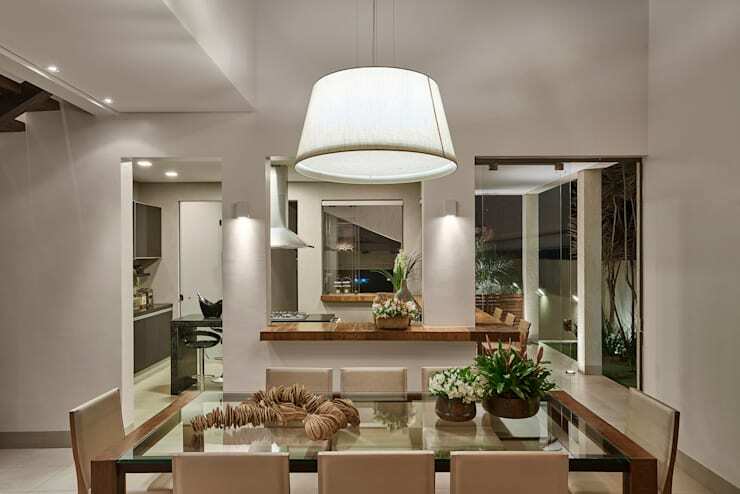 Furnishings are stylish and modern, with the hanging, water drop lights and cool hues of the built-in green room standing out within the space. Overhead, lofty ceilings create a sense of airy expansion, with wooden slats and beams infusing a traditional element within the home. The living area is set upon a slightly raised mezzanine level, elevating the space and allowing its cool tones and contemporary furnishings to be readily admired. The unique couches immediately draw focus within the area, with their comfortable, curved design and patterned upholstery setting them apart from traditional lounge suites. The remainder of the room has an air of subtle eclecticism, with the texture of the wooden wall segment contrasting with the soft green hue surrounding the television and the shag of a luxurious, silk rug. The entire space is interesting and relaxing, perfect for casual interaction. Once inside the kitchen enclosure it's immediately apparent that this space has been designed to depart from the decor and colour scheme of the living and dining areas, with soft browns and greens replaced by sleek black and silver. 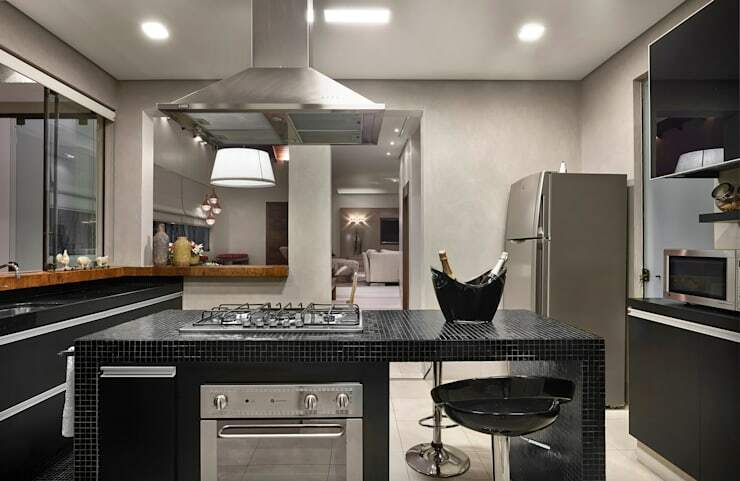 The tiles of the kitchen island practically gleam, with light bouncing off its intricate surface alongside that of the stainless steel oven, stove hood and fridge. These finishes are also featured in the cabinets and sink space, which reflect the combination of black and silver. Chic, black bar stools have been included, imbuing the room with an interactive atmosphere, as large openings in the walls look out onto the living areas beyond. A closer view of the kitchen and dining setting reveals dual areas for dining, with the glass table and chairs featured here providing a formal locale, and a range of bar stools bordering the kitchen standing ready to accommodate more casual entertaining. The kitchen enclosure incorporates a clever use of glass panelling, opening the area up to the remainder of the home and adding to the abode's inviting atmosphere. Through glass doors on the right hand side we can see hints of nature peeping into the home from the garden.These complement the array of fresh flowers included throughout the living area with more bursts of leafy green. The bathroom of the home is beautifully designed, with wood and white decor prevailing throughout. The timber trim of the large spa presents a novel design feature and contrasts brilliantly against the brilliant white of the tub.The sink unit and floor have been delicately tiled in white, adding to the luxurious feel within the room, and an expansive, circular mirror presents another point of design difference. A smattering of objects, both functional and decorative, intrigue the space. Twin metal lamps present the prospect of relaxing ambience, and vibrant potted plants refresh the room with a touch of nature. 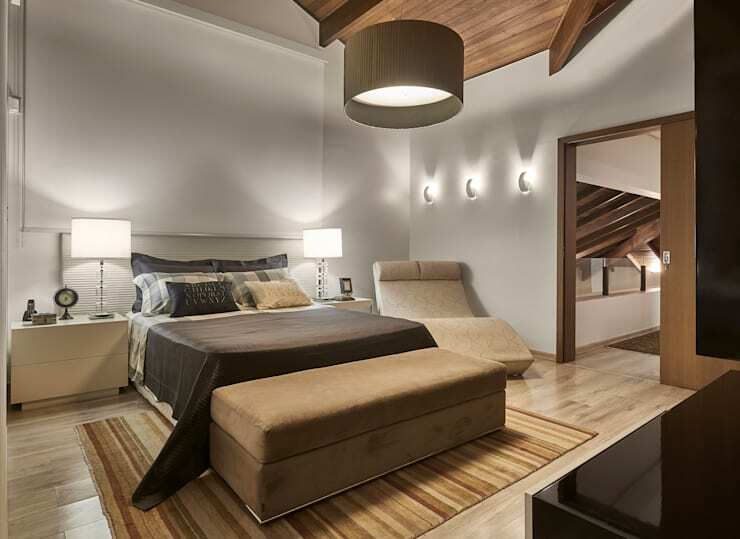 The master bedroom is resplendent in a spectrum of rich, brown tones, with the colour cascading down from the wooden ceiling and featured in the lampshade, bed, rug and furnishings. Pale wooden floorboards complete the effect, with their softer hue soothing the space. A large window behind the bed can be closed off with a heavy blind, but contributes a generous opening to refresh the space with light and air when needed, while the curved couch and perspex bedside lamps add a contemporary edge to the room. 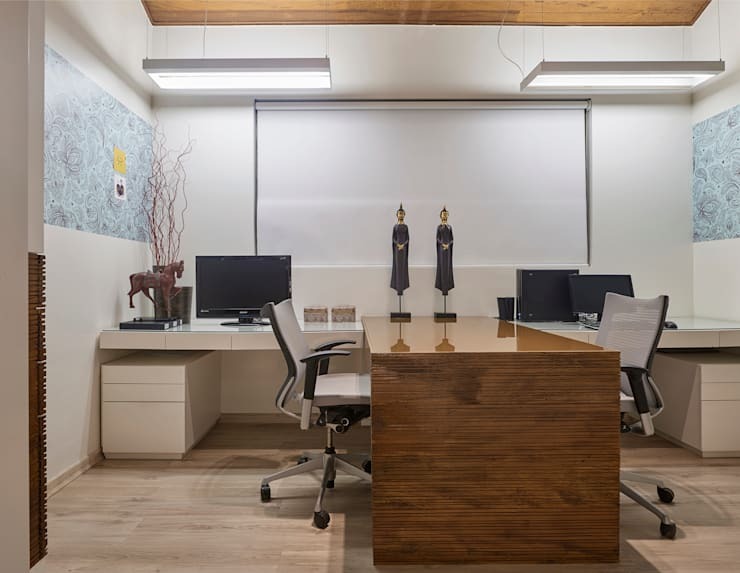 The office space within the home is streamlined and sophisticated and houses an expansive desk area to accommodate large projects. The contemporary design of the built-in desk running left to right is subtle and minimalistic, allowing the stronger form of its wooden counterpart to better stand out. A large window has been included to accommodate a view of the home’s exterior and to introduce elements of nature within the room, while patterned wallpaper and an array of decorative objects endow the office with its own unique character. 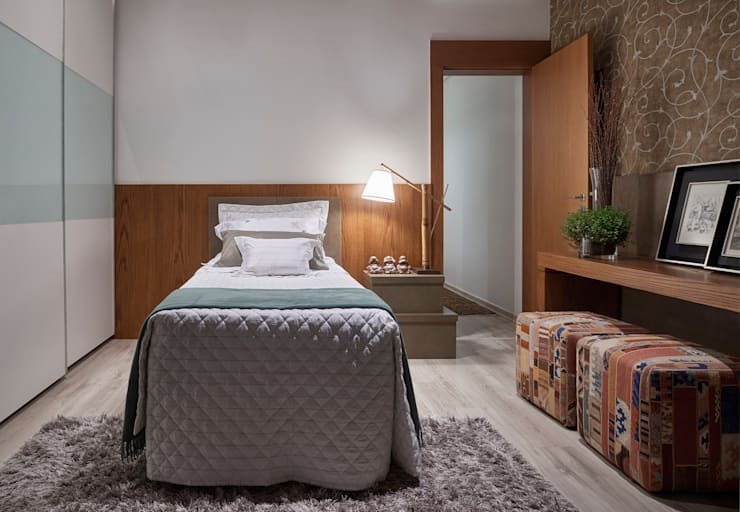 This lovely home also includes room for guests, with this bedroom presenting a simple and inviting space in which visitors can make themselves at home. The single bed appears cosy and inviting, with the warm tones of wood and the patterned brown wallpaper creating a homely atmosphere. Ample storage space has been included in a minimalistic built-in wardrobe, and the sleek lines of a wooden side table provide room for guests to relax, read and write. 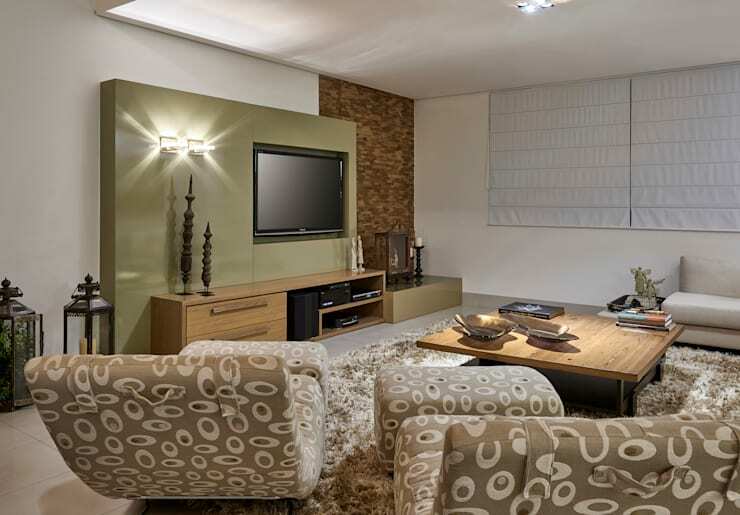 For more inspiration about inventive living spaces have a look at Creating a cosy living room! What do you think of the sleek, black kitchen in this home? Tell us your thoughts below!